Family holiday in Maria Lankowitz with a view of the lake and in the midst of beautiful nature! The Celts and Romans were aware of the fact that the region is a special place of the earth: Mediterranean climatic influences, natural treasures and scenic beauty – from the peaks of the Alps to the gentle hills of the Graz Basin. The JUFA Hotel Maria Lankowitz scores highly for the family and bathing holiday, especially with a view of the lake Piberstein and its large outdoor area. Games, fun, action and at the same time quiet spots to relax, everything is offered here. The hotel pays your entrance to the bathing area! The JUFA Hotel Maria Lankowitz welcomes its guests in 44 comfortable rooms. The inviting café with a sun terrace guarantees a successful start to the day, before active holidaymakers break into the numerous adventures of the region. Around the camp fire, the exciting life in the open air can be particularly enjoyed, preferably with something to toast on the open fire! A multifunctional sports field, as well as an adventure and play landscape with obstacle courses, invite you to carefree playing. Who would like, can also enjoy volleyball, table tennis, Flying Fox and many more social activities! Thanks to the splendid sun terrace, relaxing with small breaks is an invitation to linger! Don’t forget your sun cream! The beautiful Schilcherland stands for excellent rosé wine, the Schilcher, and endless cycling tours. The beautiful Schilcher Wine Route can be reached from the JUFA Hotel on two wheels in about 30 minutes. You will be rewarded with a view of picturesque vineyards and blooming roses. Strengthen yourself on the way in a traditional tavern! How about a trip to the most famous horses in the world? On a family holiday in the Lipizzaner homeland you can get to know the majestic candidates of the Spanish Riding School in the nearby Piber. 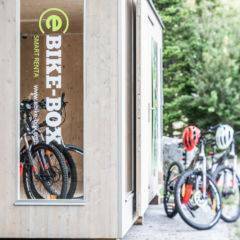 There are up to 10 e-bikes available in our e-bike box. Certainly every guest will find the e-bike that suits him. Nothing is in the way of an eventful day! The JUFA Hotel Maria Lankowitz is located in Maria Lankowitz, the home of the famous Lipizzan horses, on the shores of Lake Piberstein, It is a perfect base from which to embark on infinite adventures and can be reached easily by car. Guests can make use of the free parking spaces for cars and buses. Travelling from Vienna: From the A2-south motorway – take the Mooskirchen exit – travel towards Köflach on the B 70 – in Köflach continue on past the train station – continue on out onto the hill – take the first road on the right (Waschanlage) – approx. 800m – follow the signs to the JUFA Hotel. Travelling from Carinthia: From the A2-south motorway – take the Packsattel exit – continue on towards Köflach – approx. 14km – carry on through to the other side of the village of Pichling – take the first road on the left – approx. 800m – follow the signs to the JUFA Hotel. Travelling from Judenburg: Via Gaberl – travel towards Köflach until you reach the traffic lights at the junction – turn right – go up the hill – take the first road on the right – approx. 800m – follow the signs to the JUFA Hotel. Trains travel as far as the Köflich station (approx. 3km). For more detailed information on how to reach us by other forms of public transport, please refer to the ÖBB (Austrian Railways) and WESTbahn websites. The Schilcher Wine Route is a pearl in the southwest of Styria and leads over Hochgrail, home of the rosé Schilcher, Stainz and Deutschlandsberg and ends in Eibiswald. Picturesque vineyards and excellent taverns make this tour from spring to late autumn an ​​unforgettable experience. How about skiing or tobogganing on the western Styrian Salzstiegl? The ski and tobogganing resort has it all: 40 hectares of slopes, 12 km of runs, 6 ski lifts, rustic cottages and guesthouses. But also the day and night toboggan run scores with a 2 km long illuminated piste. The ideal winter trip on the family holiday. During a walk along the Jaokobsweg pilgrims’ trail that runs through western Styria, you will encounter people, animals, culture and tradition. You do not necessarily have to come here to explore your spiritual side, but can simply allow yourself to enjoy a leisurely and interesting walk. The walk starts from the Seckau Monastery and leads to Lavamünd via Bärnbach, Edelschrott and Osterwitz. During your walk, you will be able to achieve a vivid and highly personal impression of what inspired the pilgrims. The JUFA Mariazell-Erlaufsee Sport Resort is not only a popular holiday destination, but also provides an expert service for businesses wishing to holdseminars, training events, team meetings or workshops that are run over several days. Situated in an impressively picturesque location, our seminar room offers guests the benefit of bright natural light and is equipped with modern conference technology. Pin boards, projection screens, CD and DVD players, video projectors, flip charts and much more are available for your use. It is not only our modern facilities equipped with the latest technology that will make your event in Mariazell more productive. The JUFA Hotel Mariazell-Erlaufsee Sport Resort also offers a wide range of indoor and outdoor activities designed to boost energy levels. We will be more than happy to help you with the organisation and implementation of your plans. Are you hoping to enjoy a week of sport? Do you want to really work up a sweat on your family holiday? The JUFA Hotel Maria Lankowitz has first-rate facilities, including a games activity zone with a huge outdoor area, a multi use games area, a volleyball court and generous sized grassed areas, which are all inviting places to have fun and exercise. A football pitch with artificial turf is only a seven minute walk away from the JUFA Hotel. There is also a wide range of sporting activities on offer in the great outdoors. Whether a leisurely bike ride in the Schilcher region, a hike or mountain bike ride in the western Styria mountains, skiing or an exciting snowshoe hike in the enchanting winter landscapes of the Gaberl and Salzstiegel ski resorts: The JUFA Hotel Maria Lankowitz guarantees that you will keep fit even on your holiday. A strong team spirit and a positive working atmosphere cannot always be taken for granted. However, the ability to develop trusting working relationships can be learned. The JUFA Hotel Maria Lankowitz has the perfect facilities to suit your requirements, whether you are supervising a programme for school-aged children or running training activities for an association or a company. Students attending field trips can enjoy an engaging social experience and will learn a great deal about team spirit in the process. Staff attending company outings and training courses at the JUFA Hotel Maria Lankowitz will also find that their motivation levels, communication and team skills are enhanced. 2 seminar rooms, a games activity zone with a huge outdoor area, an indoor cinema, a multi use games area, a volleyball court and an area for campfires are among some of the many facilities available for you to use, alongside the wide range of activities you can enjoy in the great outdoors. The JUFA Hotel Maria Lankowitz has the added benefit of offering beautiful views over a 16 hectare lake. The many sightseeing locations that are within easy reach offer a range of fantastic experiences and the excellent facilities at our hotel ensure that school outings and trips organised for companies and associations are truly memorable. Looking for tips for group excursions? The many activities and attractions in the close vicinity of the JUFA Hotel Maria Lankowitz mean that you will be spoiled for choice, for example you can try introductory golf at the golf course, go on a Llama tour or visit the Piber Lipizzan Stud of the Spanish Riding School, the Bärnbach Glass Museum, the Stubalm (summer grazing pastures of the Lipizzan horses), the Arnstein Hydroelectric Power Station visitor centre and much more. "Empfehlenswertes Hotel besonders für Familien!" "Super Hotel und bestes Essen"
"Ihr seit einfach Spitze! Die Küche haut einen um." 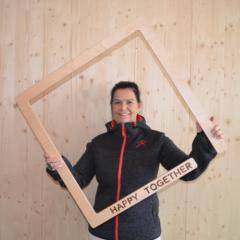 "Tolles Hotel für ein Jugendtrainingslager"
The hotel manager Monika Heinrich and her team are available to answer your questions at any time! Im interested in the offer "JUFA Hotel Maria Lankowitz" in the .